Everyday should be International Women’s Day! 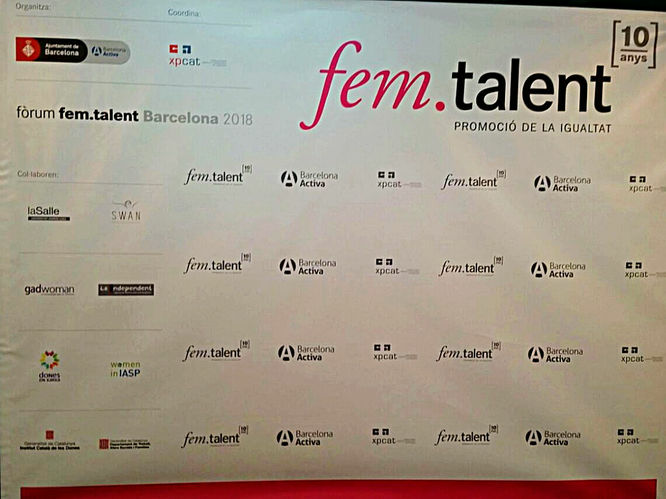 On the 9th of March, Forum fem.talent 2018 took place, celebrating its 10th years anniversary. This conference with the aim of advocating the promotion for equality, was organized by Barcelona Activa and coordinated by Municipality of Barcelona (Ajuntament de Barcelona). Mozhgan Yazdianpour, from Iran who is the Director of International & Scientific Cooperation, Isfahan Science & Technology Town (ISTT), Iran. Very confident women who knows how to get things done and this was reflected in her talks. You could hear that she knows her subject well and has the ability to have the whole room listening to what she had to say. Gabriela Ferreira, from Brazil who is the Director of Tècnica, Associacao Nacional De Entidades Promotoras De Empreendimentos Inovadores – Anprotec, Brasil. An engineer that worked hard to get where she is now, very inspiring her story and taking into account the social situation Brazil is in now, she managed to overcome that. Justyna Adamska, from Poland who is PR and Marketing Manager for Poznan Science and Technology Park, Poland. She has a PhD and shared that her ambition, passion for the field and patience helped her to develop her career. That is her tip to other women. Hauwa Yabani, from Nigeria who is the Manager Director and CEO at the Abuja Technology Village Free Zone, Nigeria. She was the most inspiring with her powerful speech. A true role model for all women we deal with prejudice and underestimation regularly. She believes that challenging oneself, as she describes herself as a go-getter, you will get to know your abilities and strengths. This helps you to get things done and be successful in what you do. The easy road will not challenge you nor show you what you are actually capable of. The keynote speaker Cheryl Miller Van Dyck, from the USA is the Founder Director of the Digital Leadership Institute and Member of the Board of Directors Digital Skills and Jobs Coalition – European Commission. She was as inspiring as at the Mobile World Congress 2018, where she won a GLOMO Awards for her achievement and contribution to women inclusion in technology (initiatives like Cypro, inQube.eu, GigitalMuse.org, AdaAwards.com). Her advice is to take the bull by the horn and start your own business; ‘it is a call to action’ as she puts it. In other words, do not wait for others to give you the opportunity, instead just go for it and support other women in doing so too. Furthermore, at the end of the conference the winners of the fem.talent Awards 2018 were announced. Their achievements were celebrated and the big winner was Sabrina Bittencourt from Brazil for the project 1hour4girls, who helps disadvantaged women in Africa to be digitally connected, women who are combatting female genital mutilation. A Digital Marketing platform and the aim is to inform, educate, share, inspire and include diversity in terms of age, background, culture, and especially women involvement in the digital, technology and science world.